Compared to string floss, water flossing is much easier to use and safer even for kids. 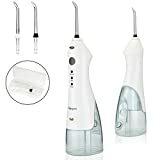 Instead of using arguably thin string that can cut into gum tissue when you’re not careful, water flosser does not involve the use of any sharp object. Water flosser takes advantage of pressurized water to penetrate between teeth and below the gum line. Think of it as low power pressure washer safe for dental hygiene purpose yet powerful enough to get rid of plague and bacteria. In addition to brushing the teeth, the generated pulsating water also helps to increase circulation to the gum more effectively. 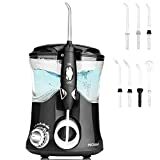 Not all water flossers in the market are created equal, however; here are top 10 water flosser products in 2019 you may want to consider. A water flosser designed for cleaning and teeth whitening purposes. 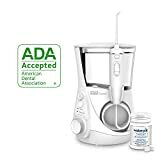 Its ADA American Dental Association Seal of Acceptance is undeniable evidence that Waterpik Whitening Professional Water Flosser has been scientifically tested and proven effective at what it does. A month supply of fresh whitening tablets and 4 different flosser tips designed specifically to work with the tablets are included in the package. An easy to use flosser handle accommodates one tablet at a time, which then will diffuse the tablet with water for the whitening action. A professional, powerful, and versatile water flosser designed for the whole family. It is packaged with 7 different flosser tips for various purposes from regular teeth cleaning to tongue scraping, from orthodontic cleaning to deep rinsing below the gum line. One of the best things about Nicefeel Water Flosser is that all pieces are arranged neatly into a single unit. The motor is also relatively quiet at only 50dB. With pressure range starting from 30 to 125 psi, this water flosser caters to both children and adults. A cordless water flosser unit designed for ease-of-use and portability. 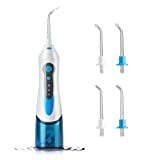 Zerhunt Professional Cordless Water Flosser is compact to carry on the go yet the motor generates enough power to deliver water pulse of up to 1700 times per minute. Its tip, handle, and refillable water reservoir are integrated into an ergonomic design without sacrificing efficiency. The entire unit, even when assembled, is IPX7 waterproof. The water reservoir, despite its small dimension, offers 200ml capacity enough for 50 seconds of continuous flossing. Another battery-powered cordless water flosser designed with simplicity in mind. 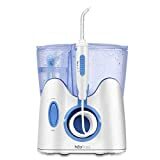 Package includes oral irrigator, 2 flosser tips, USB cable, charger adapter, travel bag, and manual. Water reservoir is not detachable, but it has user-friendly cap for refilling and cleaning purposes. The Cordless Water Flosser by Vikeepro is waterproofed so you can use it in the shower without worrying about electrical issues. Its powerful motor can deliver up to 90psi of water pressure for thorough cleaning. It is a simple water flosser with almost no bells and whistles to help clean bacteria or plague from teeth and gum. Overall dimension is quite small that even a kid’s hand can grab and use it easily. 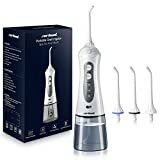 Powered by 1500mAh rechargeable battery, the Electric Cordless Dental Water Flosser can last for up to 14 days with regular daily use. USB cable and adapter for charging are included. Even at first glance, it is apparent that this water flosser by PECHAM is intended for heavy duty use. The unit is not small by any means, but it also gives the benefit of larger water reservoir and more complete accessories in one package. Water pressure starts at 30psi and can reach up to 125psi adjustable in 10 different settings. At full power, it delivers 1700 pulses per minute ideal for deep cleaning. Lower power is suitable for children or those with sensitive teeth or gum. A countertop water flosser attached high water reservoir capacity and equipped with multiple settings that the whole family can use. Thanks to its splash-proof and leak-proof design, the water flosser is quite safe when installed in bathroom. 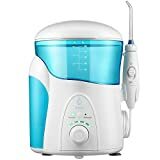 One thing that makes Lavany Water Flosser stand out from the crowd is the UV sanitizer to sterilize nozzles automatically after every floss session. Once the flosser tips compartment is closed, the sanitizer is activated to clean the tips in just 15 minutes. 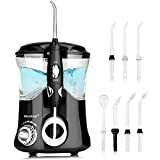 It is one of the most fully-featured water flosser in the market. The unit comes with plenty of accessories, high capacity water reservoir, and easy to operate pressure control directly from the handle. Attached with 800ml water reservoir, H2ofloss delivers flossing action for continuous 150 seconds per tank. Overall unit is IPX7 waterproofed and pretty quiet at about 50dB even when used at the highest setting. The WP-600 water flosser by Waterpik is another countertop model but compact enough to install in the bathroom. It comes with multiple pressure settings and an assortment of flosser tips. 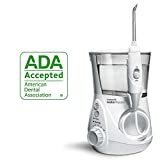 Similar to the aforementioned water flosser by Waterpik, the WP-660 is ADA Accepted as an indication that the unit meets and exceeds the market standard for products of its kind. Despite the fact that it is powered by a small rechargeable battery, the cordless water flosser by INSMART can deliver up to 1700 pulses per minute. The simple straightforward design makes it preferable among kids and adults as well. It offers basic functions such as multiple water pressure settings and 120-seconds auto off timer. With regular daily use, a fully-charged battery can last for about 2 weeks. Water flosser is a convenient more modern alternative to the conventional string floss. Although nearly all water flossers work more or less the same way, they are different in terms of build quality, ease of use, available settings, and the included accessories. Make sure you read product descriptions carefully to see if the product has the features you need and user reviews before buying.